Sakai Guides and DocumentationSakai Complete User Guide ForumsHow do I add a new topic? Topic titles are required for every topic. Be aware that this short description only allows a maximum of 255 characters. Additionally, file attachments to the forum. Click the Add attachments button to browse for and select a file. After a file is attached, the file name, file size, and file format will be displayed. There are several topic posting options from which to choose. Any settings selected here will apply to this topic only. Lock topic: This option locks the topic so users can no longer post messages. However, they can continue to read existing messages. Moderate topic: This option means all messages posted within the topic must be approved by the instructor before other students can see them. Require users to post before reading: Selecting this option requires users to post their own response first, before they can view other messages posted previously. This is a good option to select if the Instructor wishes students to respond to a discussion prompt before seeing other student responses. Posts are anonymous: Select this option if you want site participants to be able to post without displaying the name of the post's author. Note: The anonymous setting cannot be changed once the topic is created, so be certain that you want anonymous postings before saving! The default option is to Show Immediately, or choose to Specify dates to open (show) and/or close (hide). The default option is to unchecked, allowing the user mark each post as read after reading. Selecting this option will mark all messages within a conversation, or thread, as read. When grading topic posts, select a specific item for the grades to be included in the Gradebook calculations. Note: You must first create the gradebook item in the Gradebook tool before you can select it to be associated with a topic. Automatically create topics for groups. If you would like to create multiple, private group topic areas, select the radio button for Automatically create topics for groups and then check the box next to each group for which a topic should be created. Each group member will be set to "Contributor" in their group's topic and "None" in other automatically created topics. The default Student role will also automatically be set to the permission level of "None". In most cases, the default topic permissions are appropriate. By default, instructors are forum Owners, and all other site participants are Contributors. The topic owner may add and delete topics, modify permissions, edit the topic settings and topic descriptions, etc. Contributors may only read, post and reply to messages. To modify the default permissions, click Customize to expand the permission settings. Select the drop-down menu next to each role/group to choose one of the pre-configured options (i.e. Author, Contributor, None, Non-editing Author, Owner, Reviewer). 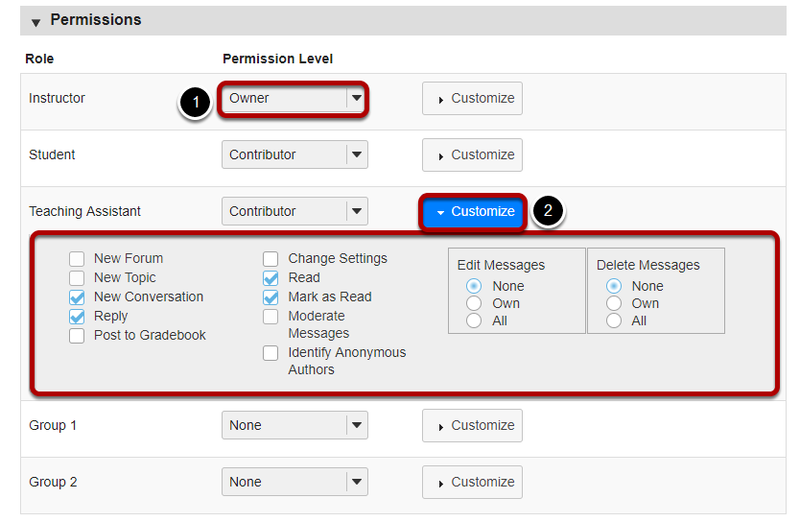 Forum permissions may be customized for different user roles, or for groups within the class. Click the Customize to further expand the options for a particular tole and define more granular custom permissions. Note: Groups must already exist in order for group role permissions to display. Once completed, scroll to the bottom of the page and select the Save button. Or if you would like to add more topics to the same forum, select the Save Settings & Add Topic button. Note: All forums need at least one topic in order to be active. Prev: How do I create a new forum? Next: How do I organize forums and topics?